What a gorgeous peachy bronze blush! It has a super long-lasting creamy mousse texture that gives a soft-matte finish with a hint of sweet shimmer. It is the perfect pop of peachy color for your cheeks! Start with 14 grams of distilled water in a sanitized beaker. Add in 0.4 grams of rice powder. Add in 0.4 grams of silica microspheres. You can purchase these from TKB Trading (HERE). Add in 0.4 grams of vegetable glycerine. You can purchase from Mountain Rose Herbs (HERE). Add in 1.4 grams of triglyceride. You could also substitute fractionated coconut oil or clear jojoba oil. Add in 1.5 grams of emulsifying wax. I get mine from Mountain Rose Herbs. You can shop HERE. Finally, add 0.3 grams of cetyl alcohol to the other ingredients in the beaker. You can order this ingredient from Lotion Crafter (HERE). Place the beaker with the ingredients into a simmering water bath. Stir the ingredients until fully melted together. Takes about 5 minutes. Turn off the heat and allow the beaker to remain in the hot water so the ingredients stay liquid. I chose three colorants from TKB Trading. You will need 1 gram of Satin White, 1 gram of Shimmer Tangerine Pop, and 0.8 grams of Bronzed Gold. You can find these mica colorants HERE. Your mixture will look like this when fully melted and combined. Now it is time to add in the pigments and blend well. Stir and smooth until the colorants are fully dispersed. I added in a 100% pure essential oil blend called "Bloomers" from Essential Wholesale. I added in just 5 drops. 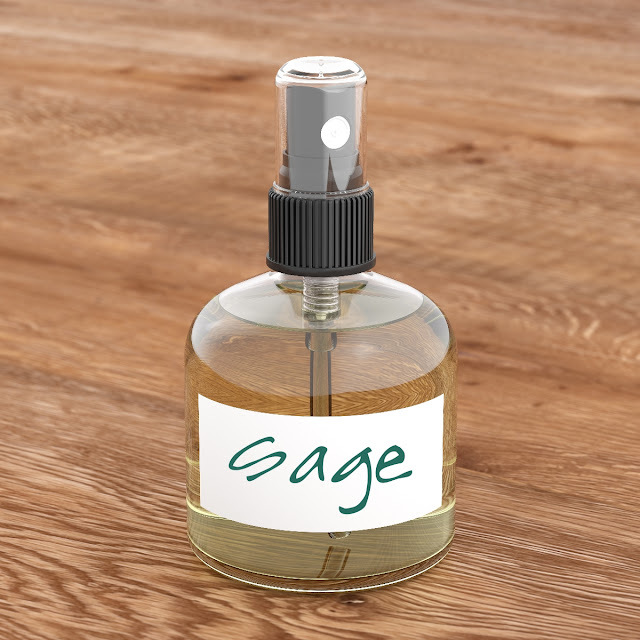 You can omit the fragrance or add a different essential oils such as geranium, lavender, rose or sweet orange. I preserved my formula with 0.8 grams of AMTicide Coconut and 0.8 grams of Leucidal liquid. Once the formula was under 100 degrees F, I blended in the preservatives. You MUST use a preservative with this recipe. 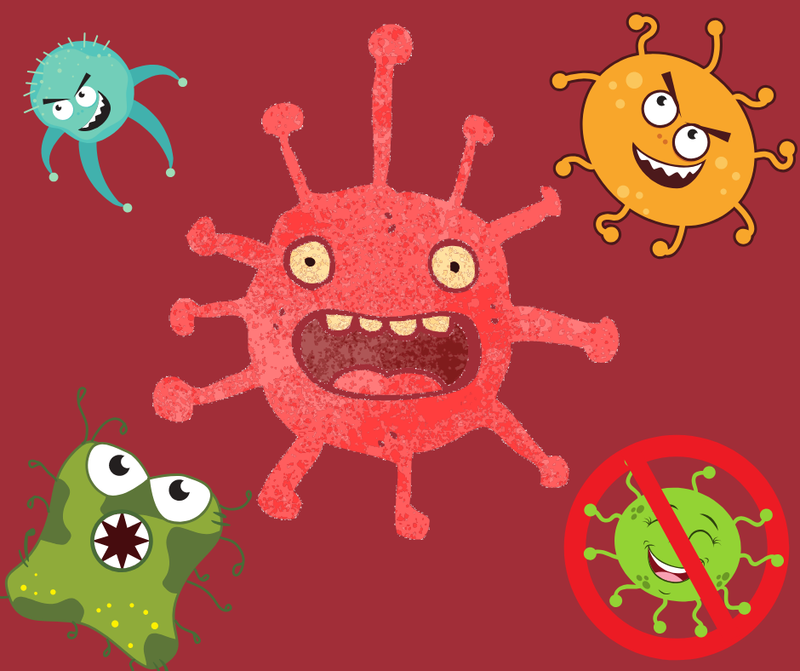 There is water and food for molds and nasty bacteria to thrive on. Use whatever preservative you like or you will need to store it in the fridge and use it up quickly. Transfer to a sanitized container of your choice. 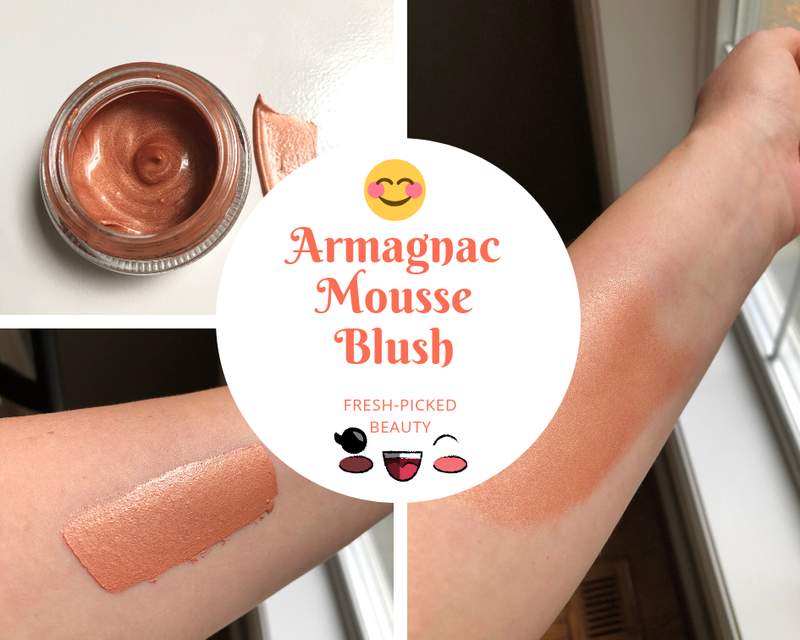 Here is the blush swatched on my arm in natural light. Here is the blush when blended out. To use: dip a clean cotton swab into the blush and dot a small amount on the applies of your cheeks. Gently smooth in a circular motion to make your cheeks glow. Apply more to build up the coverage and color. ***Never put your fingers directly into the product. Store in a cool and dry environment. 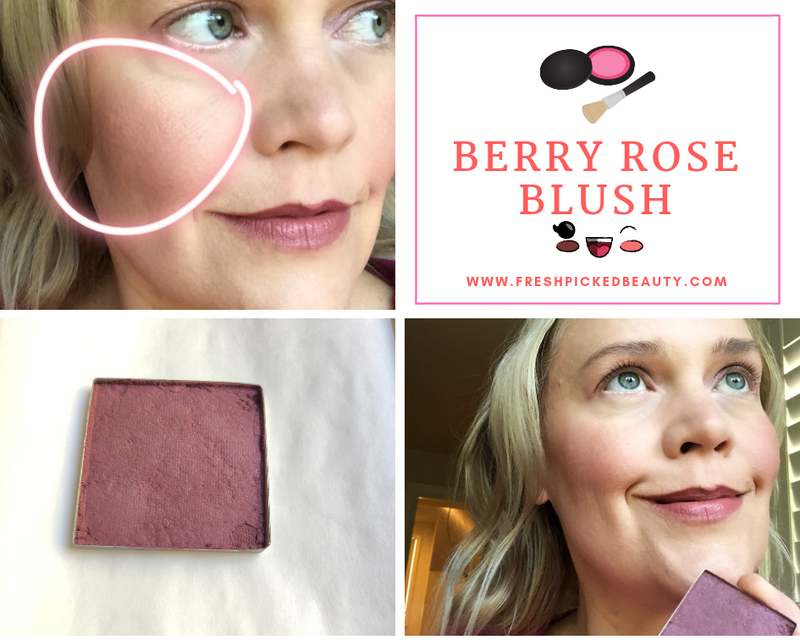 I am in love with this gorgeous berry-ish/rose-ish shade of pressed blush. It is going to look totally amazing on all skin tones! It will brighten up your cheeks and give you a healthy glow. Not glittery or shiny at all. This is a soft matte with just a bit of shimmering rose color. Start with 0.40 grams of my Ultimate Pressed Eye Shadow Base (you can find the recipe and tutorial HERE). If you don't have my formula, there is a great pre-made pressing base sold by TKB Trading that you can find HERE. I use this small grinder for mixing small amounts of powders and pigments. Iron oxides are rather difficult to blend by hand. Sometimes I use a coffee bean grinder for larger amounts, but today I used this small grinder. You can purchase this on Amazon. Add the Ultimate Pressed Eye Shadow Base into the grinder cup. Add 0.15 grams of rice powder to the grinder cup. Add in 1.0 gram of Extender White (a mixture of mica and titanium dioxide) to the grinder cup. Add in 0.50 grams of red oxide (blue shade) to the grinder cup. Start the grinder and mix for a few minutes to fully mix the powders together. Wear a dust mask to be on the safe side and not breath in any of the dust. After you have mixed the powders together, transfer them to a small plastic bag. Add 0.50 grams of TKB Trading Shimmer Raspberry Pop pigment to the baggie with the powder. You can't grind the mica with the other powders because it is so fragile. You need to be gentle with mica powders. Spend about 2 minutes massaging the bag to fully incorporate the powders with each other. You will need 0.06 grams of Leucidal Liquid PT (made for powdered formulas) or another preservative of your choice. If you use a different preservative, follow the suggested usage rate for that particular product. You don't want mold and fungus to grow in your powder. The company suggests that you spray the liquid over the powders and pigments. I use this tiny little spray bottle to mist the preservative over the powders and then gently blend. 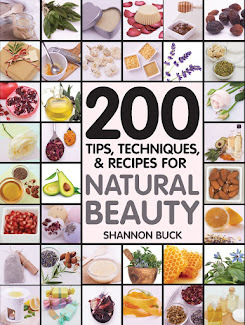 You will need 40 drops of Squalane or jojoba oil. Drop-by-drop, add it over the powder. Drop-by-drop, add in 40 drops of 190 proof vodka (or 90% rubbing alcohol). Stir the powder until it resembles moist sand. Spread out about 2/3rds of the mixture into a 38 mm square pan and gently even out. You can place a piece of paper towel or ribbon over the powder, add the pressing tile over the ribbon and then press with the tamping gadget. You can find pans and pressing tiles/gadgets at TKB Trading. Shop HERE. You will have a layer of pressed shadow in your pan. Evenly distribute the remaining amount of loose blush powder into the pan and press again. Pay attention to make sure you get the powder into the corners. Pressed for the second time. Here the blush is swatched on my hand in natural sunlight. Here is the blush blended out a bit in natural light. I am wearing this gorgeous blush in the photo above. It is smooth and easy to blend. Hope you enjoy this formula. 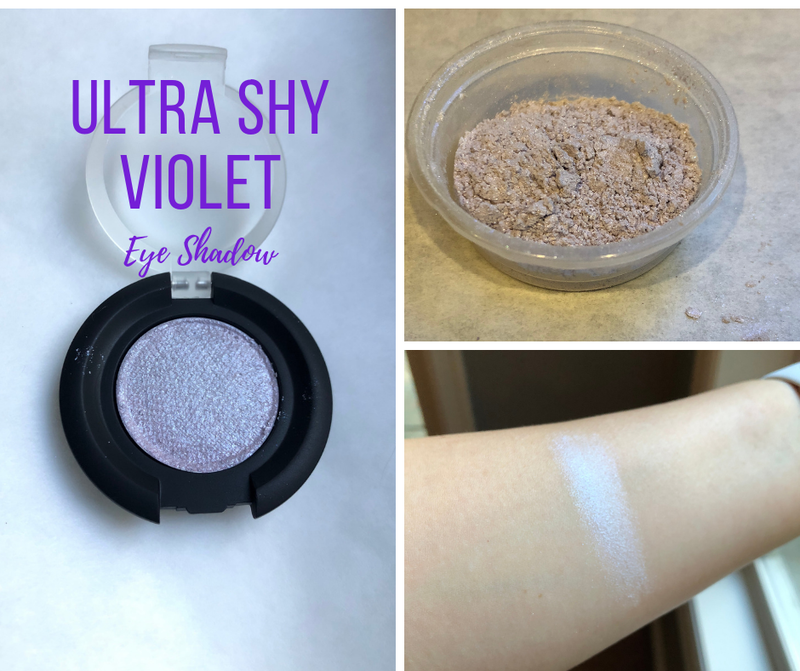 In celebration of the 2018 Pantone Color of the Year, I have made a beautiful soft shimmery violet pressed eye shadow. I call it "Ultra Shy Violet" because it is the most subtle soft lilac shade of gorgeousness! This is super beautiful and will brighten up your eyes! Wear it alone or as a base shade. 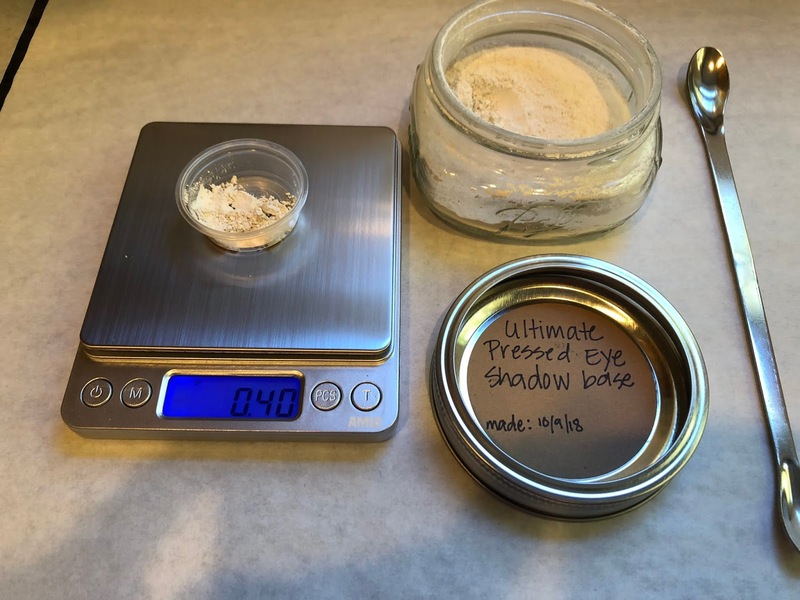 You will need the Ultimate Pressed Eyeshadow Powder Base that I made. You can find the tutorial for that recipe HERE. If you don't have my formula, there is a great pre-made pressing base sold by TKB Trading that you can find HERE. Wear a dust mask!!! You will need 0.5 grams of Ultimate Pressed Eyeshadow Base or TKB Pressing Base. My tutorial can be found HERE. You need 0.25 grams TKB Pearl Violet mineral pigment. Find it HERE. You need 0.80 grams of TKB Indigo Shift mineral pigment. Find it HERE. You also need 0.20 grams of TKB Pearl White mineral pigment. Find it HERE. Place all three pigments and the pressing base into a small plastic baggie. Seal up the bag and massage it gently to evenly blend the powders. Mica powders are very easy to blend into the base. Pour the blended powders into a small mixing container. The blended powder is a very soft and shimmery lilac color. You will need 30 drops (1 ml) of 190 Proof grain alcohol and 30 drops (1 ml) of Squalane Olive Oil. You can substitute 91% rubbing alcohol if you need too. You can also substitute clear jojoba oil in place of the squalane olive oil. I used small pipettes for the oil and vodka. I also used the TKB mini eyeshadow tin and compact and the pressing gadget (looks like a fancy cabinet pull). You can find all of these items HERE. Add the alcohol and oil, drop by drop, over the top of the powder. Mix the powder until it resembles moist sand. This appearance means it is the perfect consistency to press. Using about half of the mixture, fill the eyeshadow pan and smooth out. Place a piece of ribbon or paper towel over the eyeshadow pan. Place the pressing disc over the ribbon. Place the tamping tool over the pressing disc and apply even pressure with your hand to press the powder firmly into the pan. Your eyeshadow will look like this. Notice the texture from the ribbon. Add the remainder of the powder into the metal pan. Place the ribbon back on top, place the clear disc over the ribbon and place the tamping tool over the disc. Press again with firm and even pressure. You should have a nicely packed eyeshadow that is ready to be placed into the compact. You can apply a few drops of glue to the bottom of the compact and place the shadow pan in to secure it. Here it swatched on my arm in natural light. Choose a preservative you are comfortable using and follow the recommended useage amounts and guidelines. Non-preserved eyeshadow can grow mold and fungus and you don't want that anywhere near your precious eyes.